A crunchy, buttery graham cracker crumble creates a topping for this great tasting pumpkin pie or sprinkle it over individual servings. The pumpkin pie filling is a classic mixture of spiced pumpkin puree with brown sugar and eggs. Use refrigerated pie pastry sheets or your favorite homemade crust recipe. Break the graham crackers up into pieces. Combine in a bowl with the brown sugar, 1/4 teaspoon of cinnamon, salt, and melted butter. Toss to combine thoroughly. Spread out on a parchment or silicone mat-lined baking sheet. Bake at 350 for about 12 to 15 minutes, until browned. Prepare the pie pastry. Roll out and fit into a 9 to 9 1/2-inch pie plate. Flute or crimp as desired. Heat the oven to 400 F. Place a large baking sheet in the oven to heat. In a large bowl, whisk the brown sugar, eggs, salt, 1 teaspoon of cinnamon, ginger, nutmeg, and allspice until well blended. Blend in the pumpkin, then add the cream or milk and blend well. Remove the pie to a rack. Take pieces of crumble and break them up; sprinkle over the top of the pie. 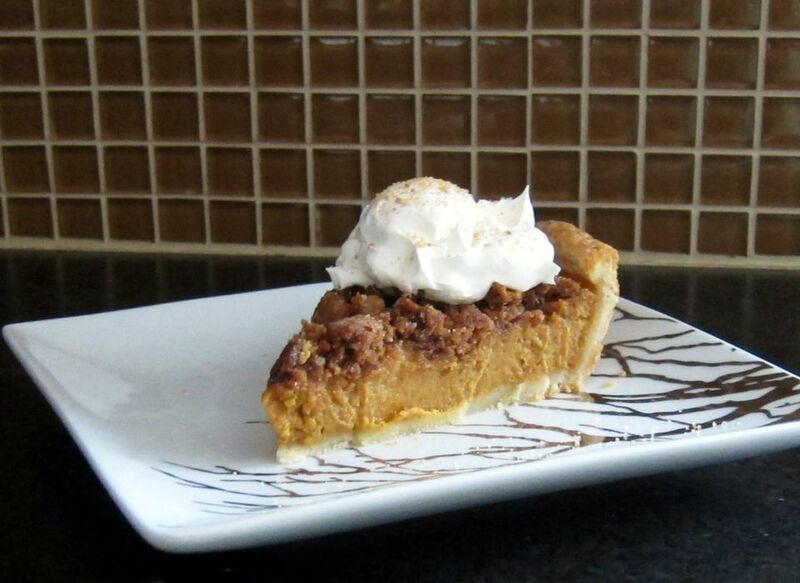 Or, sprinkle servings of pumpkin pie with a dollop of whipped cream and some of the crumble.